Of the most popular painting media, watercolour is the most inappropriately-named. Oil paint uses drying oils as its binder, which locks the pigment particles onto the ground; I have summarised its history here. Pastels are sticks of pigment and filler which are applied to a ground and adhere mechanically; I have summarised their history here. Water is, of course, not the binder in watercolour, but the diluent, used to turn blocks of hard pigment and gum binder into liquid paint. Water is also the diluent for several other media, including fresco (painted into wet plaster), distemper or Tüchlein (with a binder of animal-derived glue), tempera (egg yolk as the binder), and others. Water-based paints have a history which stretches right back to the first cave paintings, but gums were probably introduced progressively during the Middle Ages, at least in Europe. The main gum used as the binder in watercolour paints is gum arabic, the hardened sap from some species of acacia tree. Historically, this was produced in Arabia and west Asia, but is now almost entirely produced in Sudan and neighbouring areas. Watercolour paints were made by grinding pigment with water containing gum arabic, then forming the paste into small dried cakes. Varying amounts of filler, such as chalk, can also be added to the paint to reduce the intensity of the colour, and to make it opaque when applied. Gouache paints are intended to be fully opaque, but undergo significant colour shift when they dry. ‘Pure’ watercolour paints normally have some degree of transparency, while those which are more opaque are often referred to as bodycolour, gouache, or opaque watercolour. There is no absolute distinction between watercolour and gouache, nor between paintings which use the white of their paper support as their whitest tone, with transparent paints, and those in which chinese white paint is the whitest tone, with opaque paints. The former transparent technique has become associated with an ‘English School’ which is neither English nor a coherent school. The latter opaque technique has also been used extensively in illustration and design, which has only added to its patronising treatment by those who consider that they are practitioners of ‘pure watercolour’ technique. In reality, many of the greatest watercolour artists use both transparent and opaque watercolour paints, and form highlights using ‘reserved’ white from the paper support and with opaque white paint. 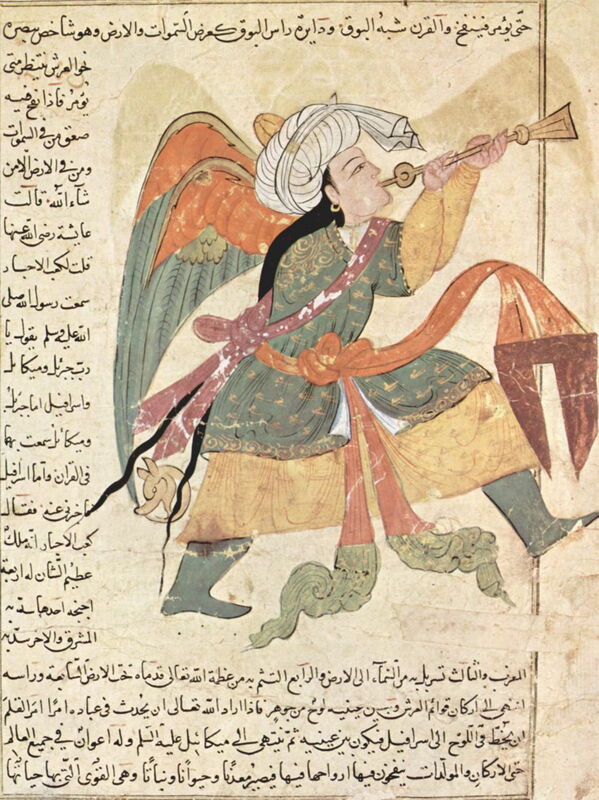 Zakariya al-Qazwini (1203-1283), The Archangel Israfil, from Kitab Aja’ib al-makhluqat wa Gharaib al-Mawjudat (Wonders of Creation) (1280), opaque watercolour, ink and gold on paper, 32.7 x 22.4 cm, Freer Gallery of Art, Washington, DC. Wikimedia Commons. Small works incorporated into manuscripts and books – miniatures – were probably the first true watercolour paintings, although they are not usually included in the history of the medium. Further to the east in Asia, inks based on dyes and water were long predominant, and ‘true’ watercolour painting was not introduced until later, from Europe. Watercolour first became established as a major painting medium in the Renaissance, most particularly in the paintings of Albrecht Dürer, who was one of the first major and most innovative watercolour artists. 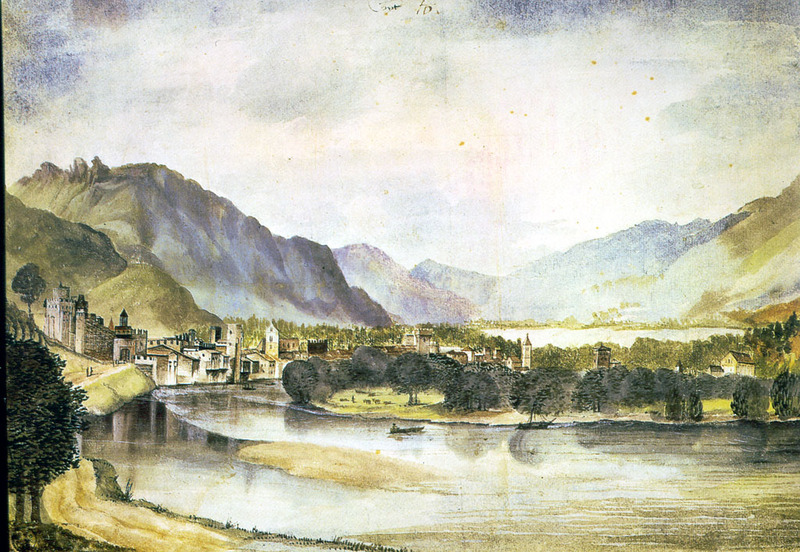 Albrecht Dürer (1471-1528), View of Trento (1494-5), watercolour and bodycolour on paper, 23.8 x 35.6 cm, Kunsthalle, Bremen; currently held by the Russian Federation, Moscow. WikiArt. Dürer travelled extensively through Europe, making views such as this fine landscape of the town of Trento, which is the more remarkable for its extensive use of reserved white space and transparent paints. Works such as this were therefore effectively the foundation of the ‘English school’, by a German. 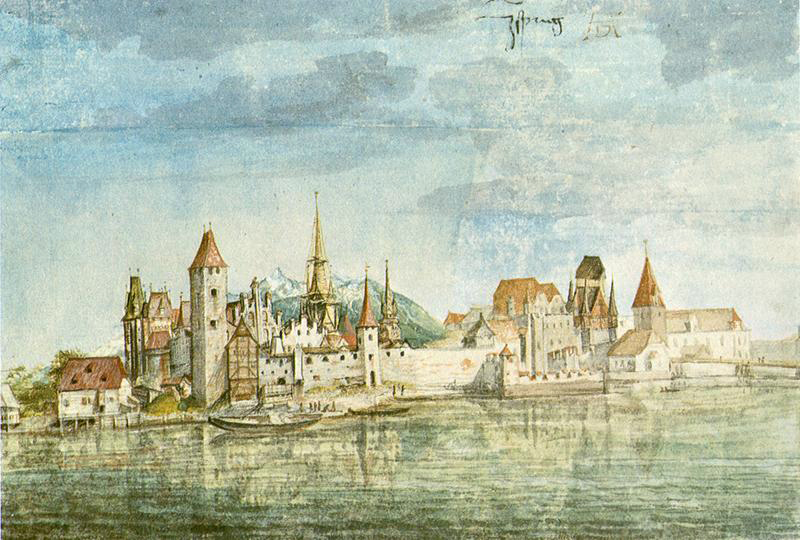 Albrecht Dürer (1471-1528), View of Innsbruck (c 1495), watercolour on paper, 12.7 x 18.7 cm, Albertina, Vienna. WikiArt. This topographic view was the precursor to a whole industry which was to create similar views of towns and countryside throughout Europe over the following centuries. 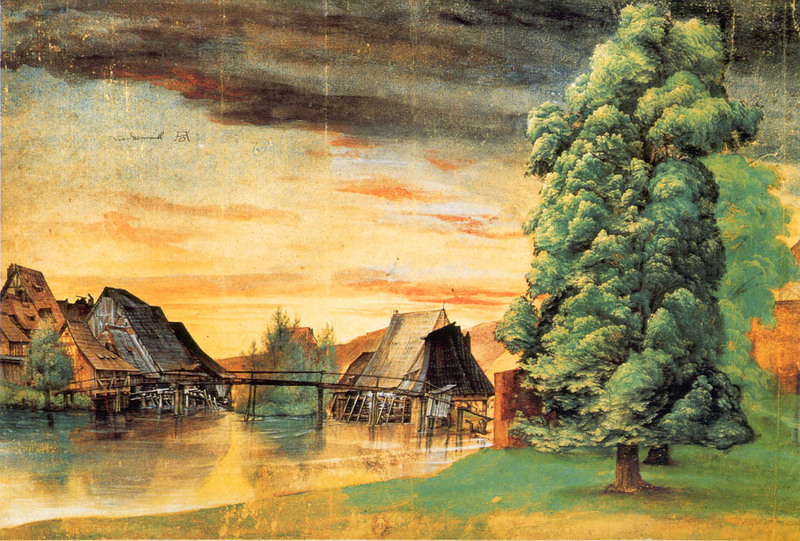 Dürer uses a range of sophisticated techniques, including the use of layers, and there are passages which appear to have been painted over when the underlying paint was still wet – wet on wet or wet in wet technique. Albrecht Dürer (1471-1528), The Willow Mill (1498 or after 1506), watercolour, bodycolour, pen and ink on paper, 25.3 x 36.7 cm, Bibliothèque Nationale, Dept des Estampes et de la Photographie, Paris. WikiArt. Dürer’s watercolours are also some of the earliest pure landscape paintings, exploiting transient effects of light to enhance their appearance and aesthetic appeal. 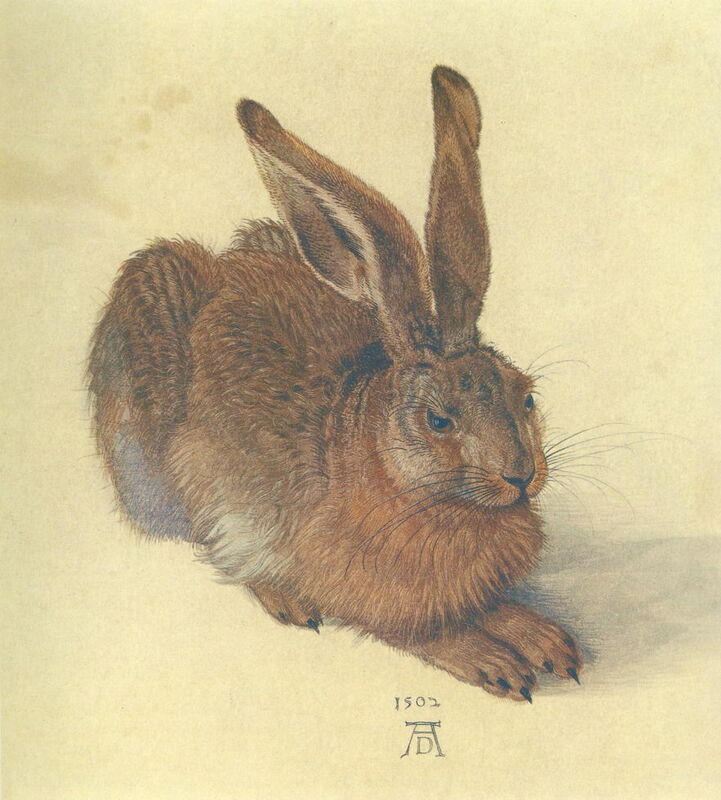 Albrecht Dürer (1471-1528), Hare (1502), watercolour and bodycolour on paper, 25 x 22.5 cm, Albertina, Vienna. WikiArt. Dürer also initiated the use of watercolour in specialist genres – here the recording of wildlife. 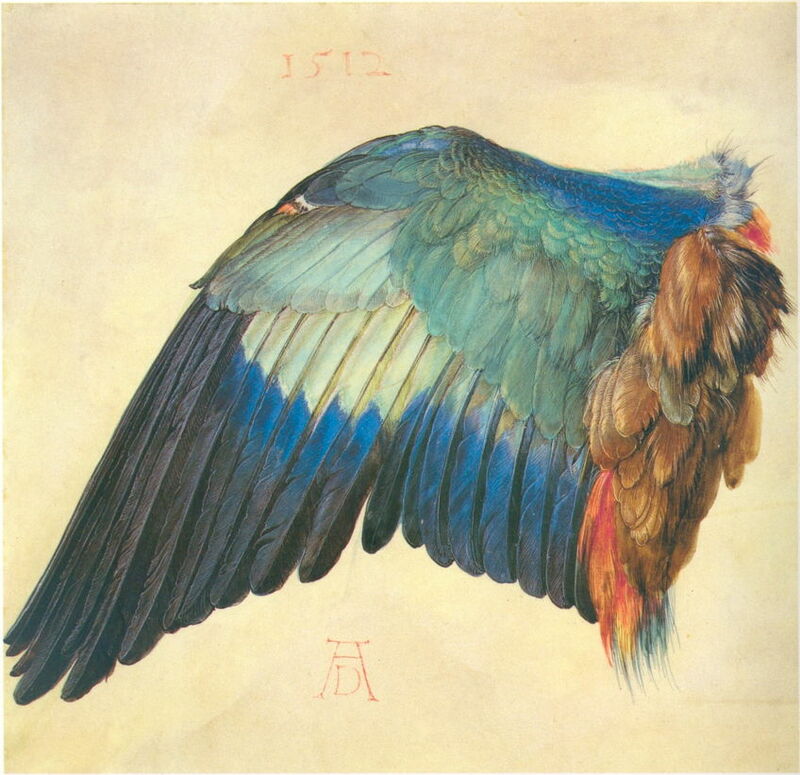 Albrecht Dürer (1471-1528), Wing of a Blue Roller (1500 or 1512), watercolour and bodycolour on vellum, 19.6 x 20 cm, Albertina, Vienna. WikiArt. He anticipated the use of watercolour to make accurate depictions of the form and colours of birds, which was to reach heights in the early nineteenth century in the paintings of John James Audubon (1785-1851). 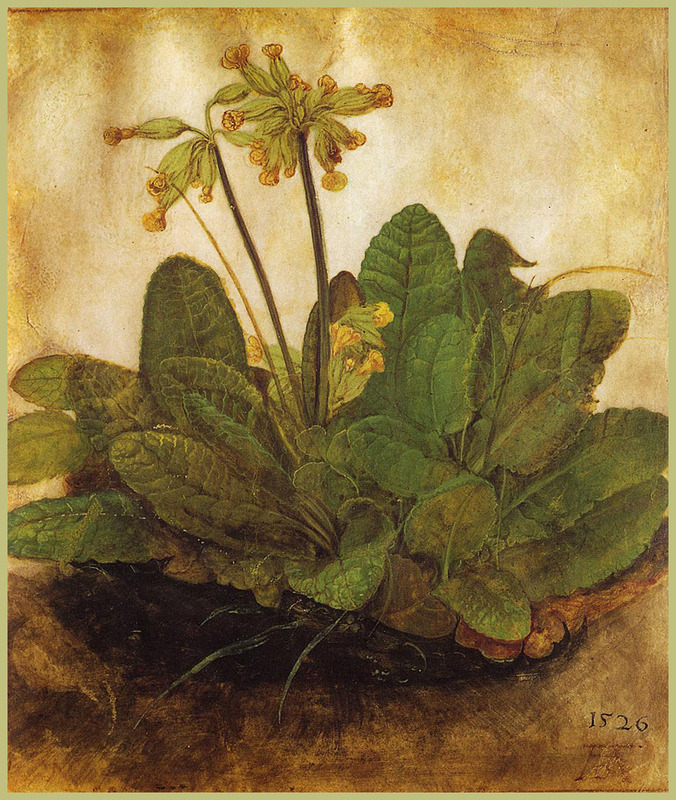 Albrecht Dürer (1471-1528), Primula (1526), watercolour on paper, 19 x 17 cm, National Gallery of Art, Washington, DC. WikiArt. Dürer’s watercolours of plants were the foundation of specialist botanical art. At about the same time, artists in the southern Renaissance were turning to watercolour to lay out works to be implemented in other media, such as fresco and tapestry. Some of the most remarkable early examples are Raphael’s ‘cartoons’, although some were probably painted in distemper rather than using gum-based watercolour paint. Raphael (Rafael Sanzio de Urbino) (1483–1520), The Miraculous Draft of Fishes (c 1515-16), bodycolour over charcoal on paper, mounted on canvas, 319 x 399 cm, The Royal Collection of the United Kingdom, UK. Wikimedia Commons. 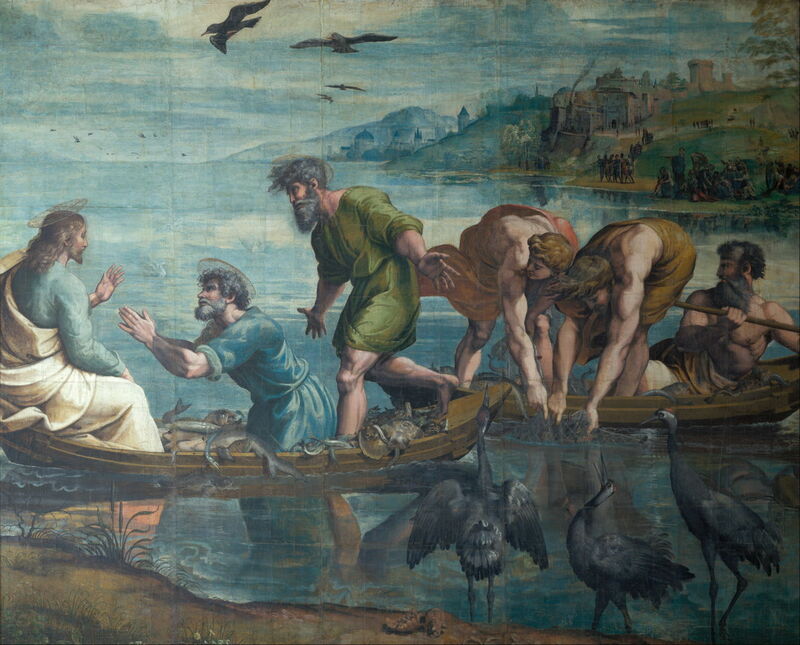 Raphael’s The Miraculous Draft of Fishes (c 1515-16) is among the earlest large and complete paintings using opaque watercolour. Because of limitations in the manufacture of paper at the time, it was made on many sheets which have been mounted on canvas. The detail below shows Raphael’s command of the medium, and his use of white paint (then probably using a lead pigment) for its highlights. 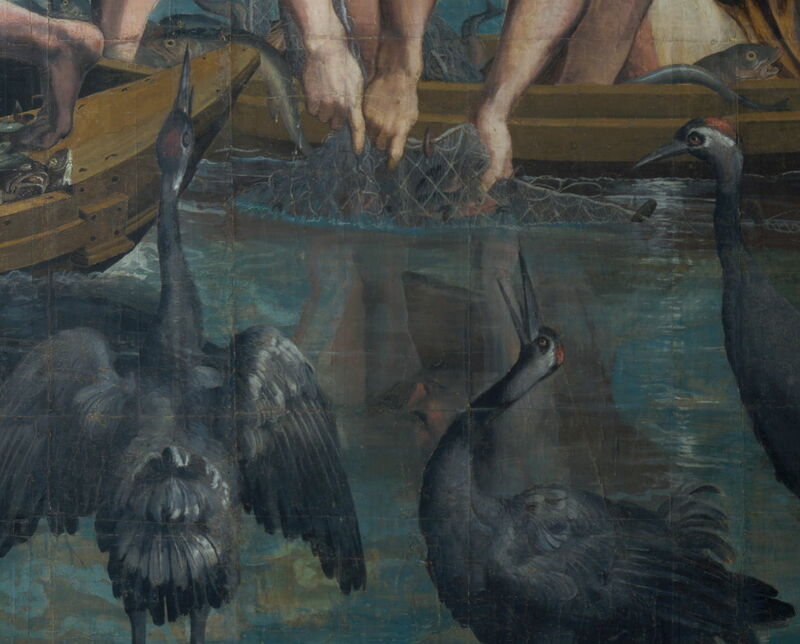 Raphael (Rafael Sanzio de Urbino) (1483–1520), The Miraculous Draft of Fishes (detail) (c 1515-16), bodycolour over charcoal on paper, mounted on canvas, 319 x 399 cm, The Royal Collection of the United Kingdom, UK. Wikimedia Commons. Hans Bol (1534–1593), Landscape with the Fall of Icarus (1550-90), watercolour on paper, 133 x 206 cm, Museum Mayer van den Bergh, Antwerp, Belgium. Wikimedia Commons. 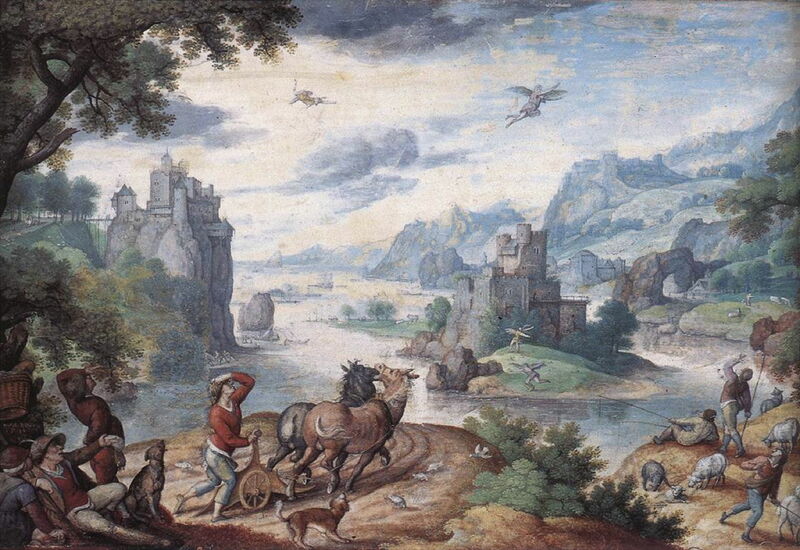 Watercolour continued to be used by a few artists to create ‘finished’ works intended to be viewed by others, such as Hans Bol’s narrative painting of Landscape with the Fall of Icarus (1550-90). Peter Paul Rubens (1577–1640), Landscape (c 1635-40), gouache, 24 × 45 cm, Hermitage Museum, Saint Petersburg, Russia. Wikimedia Commons. However, the Old Masters generally used the medium when painting in front of the motif, to create studies for use when painting finished works in oils, for example. 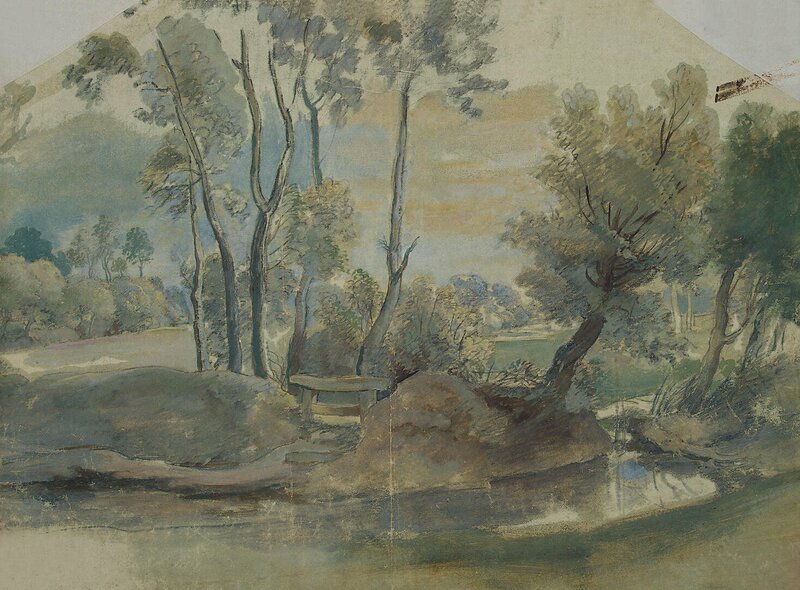 Rubens’ landscape sketch demonstrates his skills with mainly opaque watercolour. 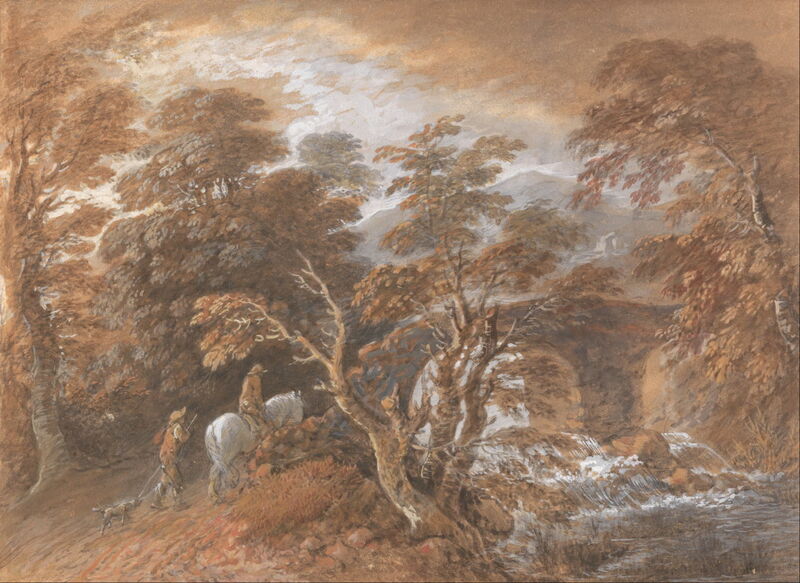 Thomas Gainsborough (1727–1788), Hilly Landscape with Figures Approaching a Bridge (c 1763), watercolor, 27.9 x 38.1 cm, Yale Center for British Art, New Haven, CT. Wikimedia Commons. Gainsborough was another oil painter who made many fine watercolour studies. Today, many of these appear to have been painted in a very limited range of colours, although in some that is the result of fading of the fugitive pigments which were used. Oil paints lock their pigments into layers which provide better protection for those which are prone to discolour. By the end of the eighteenth century, there were some artists – particularly those like Giovanni Battista Lusieri who made landscape views – who worked almost entirely in watercolour. His large panorama of the Bay of Naples had to be painted on six sheets of paper, and uses a combination of transparent technique and opaque paints in extreme photorealism. 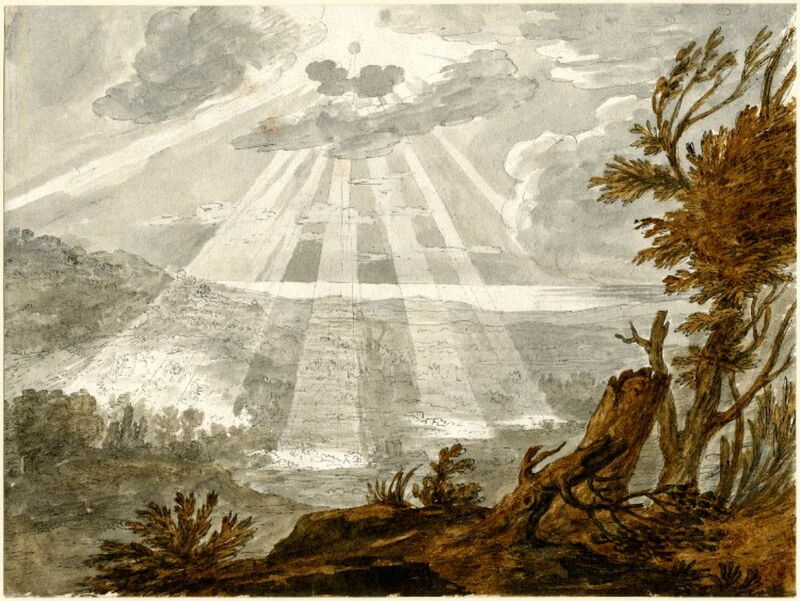 Alexander Cozens (1717–1786), (Landscape with sun breaking from clouds) (c 1746), pen and black ink, with grey wash and watercolour on paper, 21 x 28.2 cm, The British Museum, London. Courtesy of and © Trustees of the British Museum. During the eighteenth century, as people started travelling more, and upland and coastal areas were visited by those in search of the ‘sublime’, increasing numbers of artists turned to watercolour for making topographic views. Although most were formulaic if not illustrative, artists like Alexander Cozens used watercolour in more sophisticated paintings. 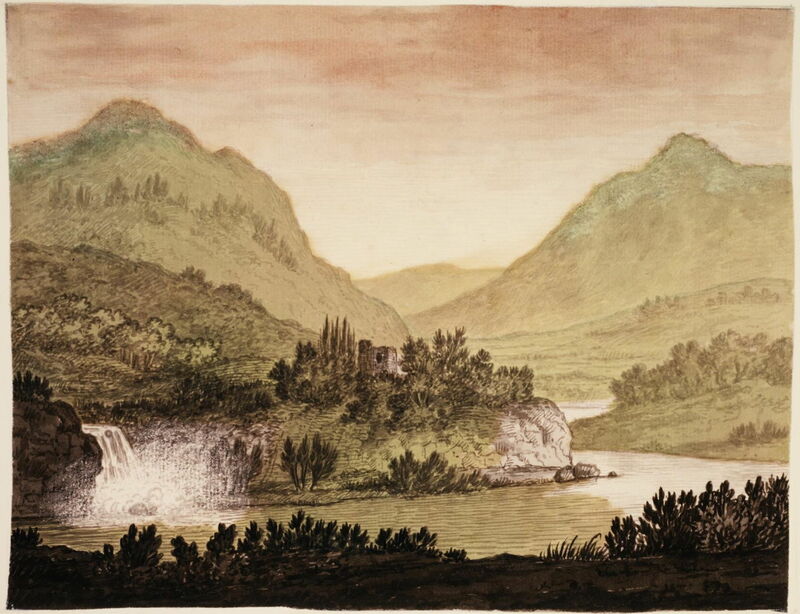 Alexander Cozens (1717–1786), Mountainous Landscape with a Castle and Waterfall (date not known), watercolour on paper, 16 x 22.9 cm, The Victoria and Albert Museum, London. Image courtesy of and © Victoria and Albert Museum, London. These watercolourists also developed new techniques: Cozens has here used a combination of reserved white space on his paper for some highlights, and in the waterfall has scratched away parts of his paint to form the spray. 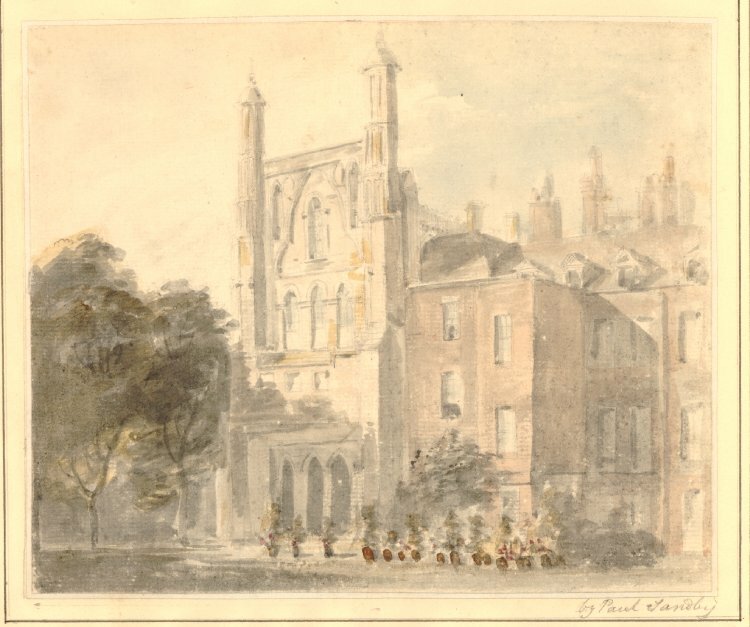 Paul Sandby (1730/1-1809), View of the south end of the old House of Commons (1794), watercolour, 17.5 x 21.1 cm, The British Museum, London. Courtesy of the British Museum, via Wikimedia Commons. By the end of the eighteenth century, artists like Paul Sandby were hard at work, painting watercolour views daily, to satisfy growing demand for their topographic views. Posted in General, Painting and tagged Bol, Cozens, Dürer, Gainsborough, history of painting, Lusieri, painting, Raphael, Rubens, Sandby, watercolour. Bookmark the permalink.